One of my mates who joined me on this escapade, has been going to the New Lawn and its predecessor for years. Based upon his local knowledge of Nailsworth, we popped into The Britannia Inn for a decent pre-game pint. There followed a slight traipse up the hill as we made it to the ground, which sits atop the town, and we found ourselves a spot in the South Stand terraces, near to the goal. 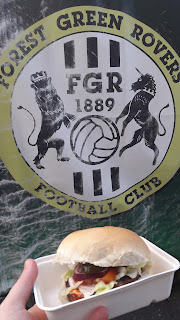 For those not in the know, Forest Green Rovers are currently experiencing the highs and lows of their inaugural season within the football league. By getting promoted, via the play-offs, from the National League (Conference), Nailsworth has become the smallest ever town to contain a football league club. There's no doubting that the rise of Forest Green Rovers has coincided with their ownership by the self-confessed hippie Dale Vince. The chairman became a majority shareholder back in 2010, and has made incremental changes to the club which reflect his own philosophy and that of his company, Ecotricity. Vegetarian diets, solar energy, cow manure on the pitch, and eventually veganism, have all been a part of the journey. Although, unsurprisingly, changes made to the club badge and the home shirt stirred up more controversy. As for the match itself, at kick-off, Forest Green Rovers vs Morecambe FC was 23rd vs 22nd in League Two. It may have only been the end of October, but as it stood, this was a 'relegation 6-pointer'! In the initial stages, the Shrimps looked the more confident and composed of the two teams, with Vadaine Oliver forcing a save in the opening minute. And as the first half wore on, it was clear that the away team had a tactic of getting the ball up to their number 9 as early as possible. In the 22nd minute, Oliver had a gilt-edged chance to repay that faith, when defender Steven Old expertly nodded a lofted cross back towards the penalty spot. Oliver was 8 yards from goal and did well to chest the ball down and to get a good connection on his volley, but his effort rebounded off the foot of the left post and away to safety. 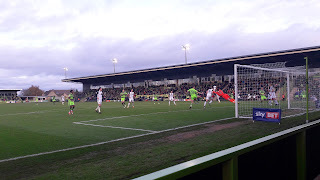 Gradually the home team eased themselves into the game, and on the half-hour mark, Forest Green Rovers took the lead. Reece Brown collected the clearance from a corner, and his reverse pass to Keanu Marsh-Brown, on the edge of the penalty area, led to a one-two with Isaiah Osbourne. The no. 7 left the Morecambe defence flat-footed and calmly passed the ball between the goalkeeper's legs for a well-worked goal. As half-time approached, hunger started to kick in, and as we were so close to the 'kitchen', it didn't take long for the 1st batch of chips to appear. By all accounts they were tasty, and the vegan curry sauce went down well. The true test was the vegan burger though, and as the 2nd half started to get underway, 3 out of 4 of us were curious enough to delve in. I admit that I've probably tried less than a handful before, but this one was at least the tastiest I've had! Into the 2nd half, and Morecambe were forced into replacing their goalkeeper in the 63rd minute. Barry Roche had taken a knock towards the end of the 1st half, but had failed to shake it off. Unfortunately for his replacement, Danijel Nizic, he was picking the ball out of his net less than 2 minutes later. Forest Green Rovers gained a free-kick about 40 yards out, Scott Laird lined it up and swung in a dangerous ball with his left foot. It managed to evade everyone and curled in, at pace, into the bottom left hand corner for 2-0. Inevitably, Morecambe were now looking a bit deflated, but they did rally enough to produce a few half-chances in response. However, the home side were fairly comfortable, and the longer their 2 goal cushion remained, the less they looked threatened. In fact, Forest Green Rovers almost added a calamitous 3rd goal in the 88th minute. Danijel Nizic passed the ball out towards one of his own defenders, who was running away from him, and the ball rebounded off of his heel and straight to Reece Brown. His shot from just inside the area was saved by Nizic, although the ball ricocheted up and onto the far post before Morecambe could clear the danger. The Shrimps managed to miss another couple of opportunities before the final whistle blew, and they slipped into the relegation zone. 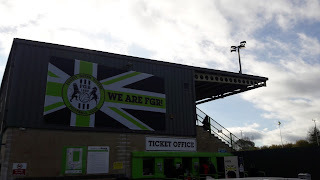 Forest Green Rovers could be pleased with a job well done, whilst Morecambe were left ruing their failure to be clinical at one end, coupled with a lack of concentration at the other. Overall our experience at the New Lawn was a pleasant one. It's a tidy little ground and the atmosphere was fairly decent in the South Stand, with ongoing chants of "Forest Green FC, black and white army", plus the match was eventful. The vegan angle offers obvious intrigue, but we were all pretty happy with the food, and shocked to learn that Carlsberg qualifies as vegan (shame it's still a crap beer though).